Welcome to the Comfort Hotel Stavanger! Do you have questions about your visit? We hope you'll find the answers you're looking for here. If you arrive by car we recommend the nearby Jorenholmen parking garage. Parking costs max. 200 NOK/24 hours. The hotel has a locked luggage storage room where you can store your luggage before check-in or after check-out. The Comfort Hotel Stavanger collaborates with the nearby ICON gym, which hotel guests can use for only 80 NOK per session. ICON is located about 300 metres from the hotel. Contact us for current opening hours and more information. All guests can access our free WiFi from anywhere in the hotel. All you need to do is connect and then keep surfing as much as you like! Drinks and snacks are available for purchase from our lobby shop, which is open 24/7. The lobby shop also serves alcoholic drinks during the hours stated on the right. Did you have a late Saturday night? Don't panic! We serve breakfast until 12 noon on Sundays and you can keep your room until 6pm, at no extra cost. So relax and sleep in. It's our treat! At Comfort Hotel Stavanger we also welcome your four-legged friends. For 250 NOK extra per visit, your pets can stay with you at the hotel. Guide dogs are of course welcome at no extra charge. But please do remember to tell us when you make your reservation, so that we can find a suitable room for you and your dog. 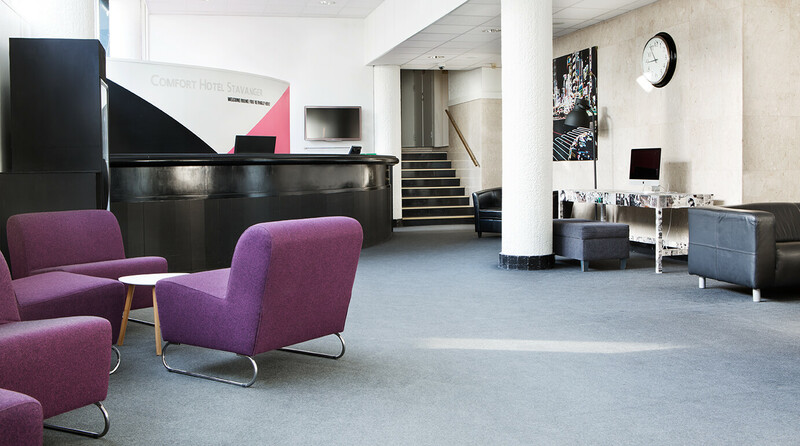 Comfort Hotel Stavanger is a cash-free hotel. This provides a safer working environment for our staff as it reduces the risk of theft and burglary. It also means that we have more time to spend on taking care of our guests. For guests it means faster and more secure payments. We accept all major debit and credit cards. Please contact us for more information. Lazy Sunday – Late check-out on Sundays until 6pm.